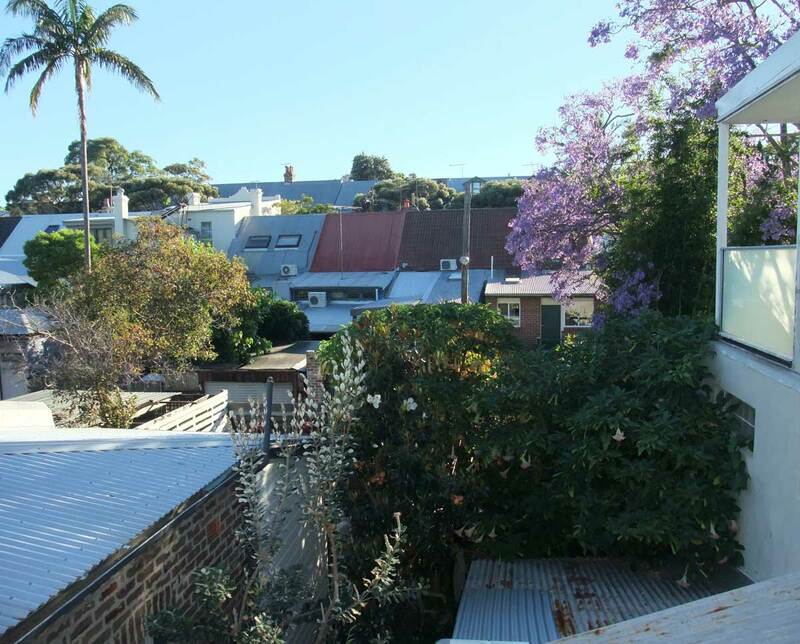 6 years ago when we moved into this old inner city house, the back garden was the local cat toilet with no trees so we planted some favourites, in the foreground is a Banksia integrifolia, the next one with the big white flowers and dark green foliage is the Magnolia grandiflora “Little Gem” these are both about 4 metres (12 foot) H now. The Apricot & Pink Brugmansias were planted from cuttings back then & are making a great canopy for the ex indoor plants to recover in. The purple Jacaranda lives two doors up and makes a great bit of borrowed landscape but as you can see all these plants still frame that back door of the place across the lane and therefore frames our bedroom window… still hoping that one day we will have a visual screen but I’m not holding my breath!! 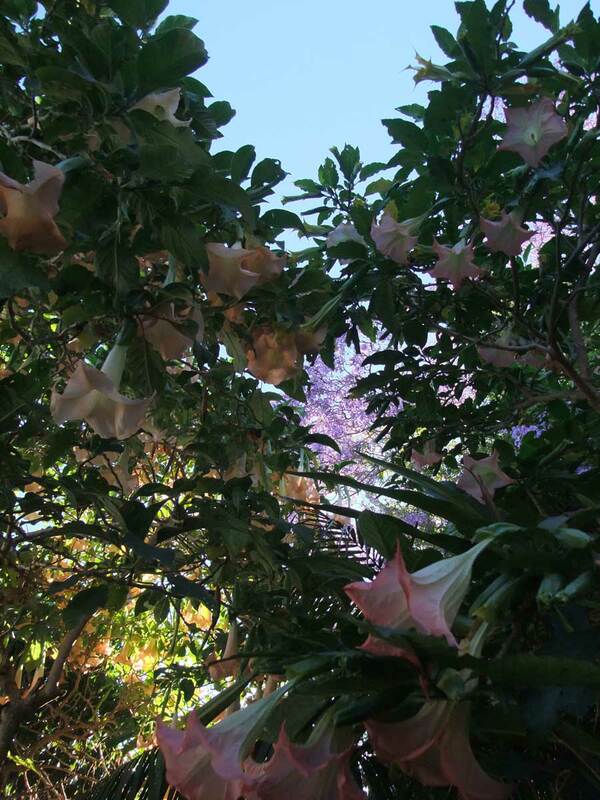 the perfume from the Brugmansias at dawn and dusk is intoxicating! Here in Texas it is cold, grey, and raining … so it cheered me to my bones to see sunshine, blue sky, and flowers. Beauteous-ness! it’s a perfect day for gardening! Mo these photos of your beautiful room with a view were just what i needed to see today. Woke up at 2:30 am to hail hitting the window. At 4 am I was up but the ground seemed dry. Checked weather and it said, light snow and later rain. At daylight I ran outside to tarp our woodpile, we don’t have a fireplace but our landlord gave us an outdoor fire pit, it was sooooo cold. So far no snow or rain but cold yes. So I’ll just close my eyes and see your lovely view and dream…dream of the first time that I ever saw a Jacaranda tree, it was when we lived in Maui and it was breathtaking, just like these photos..
Jacarandas are planted right across Sydney so we live in a purple haze every November and what with all the perfumes mingled in it’s all quite intoxicating I love the Silly Season! Yep, cold, gray, and spitting snow here too. Thank you Mo. I’m trading my view out the window for that last photo. sending lots of balmy summer vibes through the ether Beth! I never really get to use the words “purple,” “apricot” and “fragrance” in one sentence when talking about Pennsylvania! A wonderful view Mo !!!! Hi Els, Brugmansias are most definitely toxic & known to be a powerful hallucinogenic as well but I love it for the fragrance and the colour! The lushness of the plants against that blue sky feel so tropical! A great antidote to the approach of winter. I love being able to travel virtually to the other side of our planet! When it was so hot here on Friday afternoon it was very cooling visiting all you cloth conjurors in the North Countries! Oh my dear—it’s all so stunning, especially since I’m on the tip of our Northern Winter over here…how lovely to visit the bright floral view. I responded: Every every year-and we forget-just to be awakened into remembering-how the dance of it delights us-the rhythms rock and roll the old and young alike in their democracy. Michelle’s response is wonderful! Ah, this is a great time to be living in Sydney. I just glanced at my garden this morning and saw a mass of blue hydrangeas backed by apricot lilies. 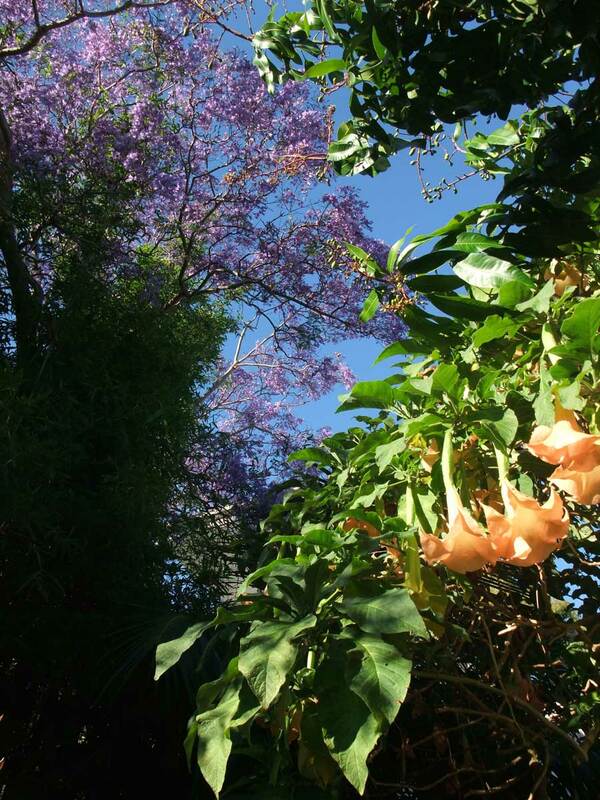 My butchered jacaranda has sprouted several new branches so I’m hoping that next year I may have some misty bluey/mauve back in my garden. I’m saving a spot for a pink brugmansia, just need to get organised enough to order one. Your garden is such an oasis, Mo, I do hope you eventually get screened from that neighbour’s doorway. just grab a cutting from this one any time, they grow very easily !